Top 10 things to do in the Finger Lakes this Winter – inside or out! Winter is a very special time in Cayuga County and the Finger Lakes region if you like the great outdoors or if you just want to stay inside and enjoy a cozy inn or bed & breakfast. Here’s our Top 10 things to do for outdoor enthusiasts and those of you that just prefer to enjoy a warm fire and sip a glass of fine Finger Lakes Wine. 1. Cross Country Skiing & Snowshoeing – Sterling Nature Center in northern Cayuga County has snowshoes that you can use for just a donation. All of the Center’s trails are open for cross- country skiing and snowshoeing all winter long, sunrise to sunset. 2. 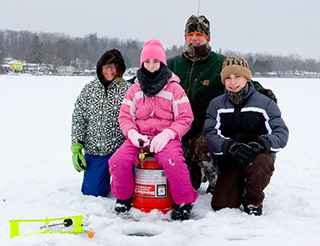 Ice Fishing – Ice fishing is available on all of our lakes. Tip: Try the north end of Cayuga Lake for northern pike, pickerel and panfish. If you need any angling gear, make a stop at Bass Pro Shops in the Fingerlakes Mall. 3. 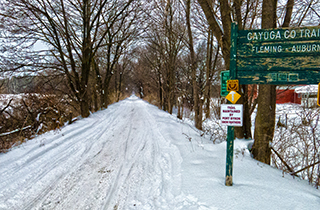 Take a hike – Cayuga County is home to over 65 miles of multi-use trails great for hiking year round. From the Owasco Flats Trail in the South to the Cato-Fair Haven Trail in the north, you’ll find hiking opportunities galore. 4. View Winter Wildlife – Montezuma National Wildlife Refuge is a great place to view native wildlife year round. Winter is an excellent opportunity to see white-tailed deer, fox, small mammals and resident birds such as woodpeckers and nuthatches. Pick up the Cayuga County Office of Tourism’s ‘For the Birds’ guide to bird watching in Cayuga County before you go! 5. Visit one of Cayuga County’s Three State Parks – Enjoy the pristine quiet of nature at Long Point State Park, Fillmore Glen State Park and Fair Haven Beach State Park. Hike, cross-country ski, and bird watch. Be sure to check out each park’s schedule before you go. 6. Ice Skate at Casey Park in Auburn. The Casey Park Ice Rink is open to the public throughout the winter on Friday and Saturday evenings. Bring your own skates or rent them for only $2! Admission is $3.00. A family-friendly activity. 7. Learn to cook! 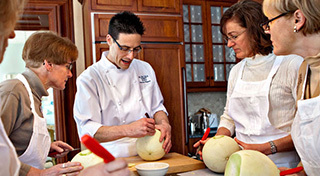 The luxurious and historic Aurora Inn overlooking Cayuga Lake offers a variety of unique hands-on cooking classes throughout the winter. Their ‘Table for Two’ class will teach you how to execute the perfect romantic meal and their ‘Perfect Pasta’ class will reveal the secrets that make their house-made pasta so delicious. Visit innsofaurora.com for details. 8. Visit MacKenzie-Childs near the historic village of Aurora. Tour the Victorian farmhouse featuring 15 rooms decorated with MacKenzie-Childs home furnishings, then visit the shop and make your own decorating plans! 9. Relax & Rejuvenate – The Center, in Auburn is a sanctuary for a lifestyle of well-being. The Center offers everything from acupuncture & herbal medicine to massage & spa treatments to yoga classes. 10. Enjoy Wine & Movie Night at King Ferry Winery every Saturday from January 9th - February 6th. With a glass of wine or craft beer in hand, and snacks to share, relax on their comfy couches and watch movies on the big screen!